The Peoples Democratic Party (PDP) Wednesday debunked a rumour that its candidate for the 2019 gubernatorial election in Lagos State Jimi Agbaje has dumped the party. “This is to disclaim the rumour going around, that our governorship candidate, Mr Olujimi Agbaje, has left the PDP,” the State Secretary of the party, Prince Muiz Dosumu said in a statement on Wednesday. Agbaje was rumoured to have dumped the opposition party because of an unresolved issue following his loss during the gubernatorial election in the state. In a follow-up tweet, Fani-Kayode claimed Agbaje told him he has not left the PDP. 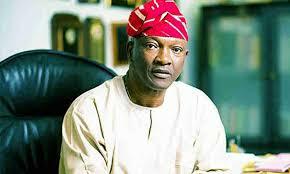 “I just received a call from my brother Jimi Agbaje. He assured me that he has NOT left @OfficialPDPNig and that the media reports were false. “My brother Gbenga Daniel also reached me and assured me that though he has left PDP he has NOT joined @OfficialAPCNg,” Fani-Kayode tweeted on Wednesday. “We cannot afford to start again as we usually do, battles after every election, till another one,” Dosumu said.